Sometimes, references to pressure transmitter accuracy are actually about the non-linearity of the pressure transmitter’s response. Although accuracy and non-linearity are related, the two terms are not the same and shouldn’t be used interchangeably. The market offers a variety of pressure transmitters. You choose which one to use based on its features, specifications, and how those fit your requirements. One common customer error, though, is to compare the accuracy of one transmitter with the non-linearity of another. 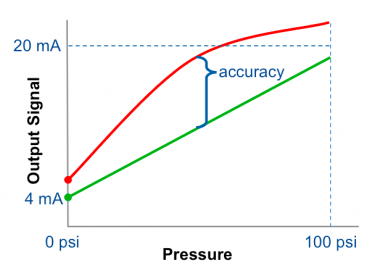 Pressure transmitter accuracy and pressure transmitter non-linearity are not the same thing. To be more precise, non-linearity is but one of the factors when calculating accuracy. And people who confuse the two may end up paying more for less quality. There will never be a pressure transmitter that exactly matches the ideal line (in green). The result will always be a slight curve (in red, exaggerated for clarity). 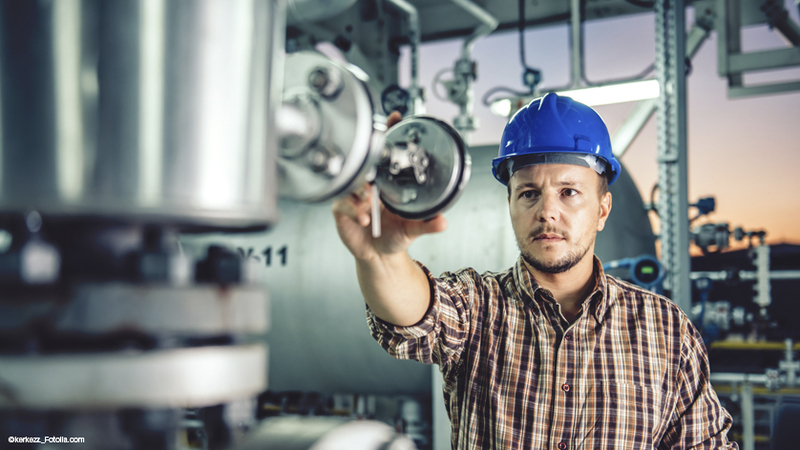 To fully explain the difference between pressure transmitter accuracy and non-linearity, one needs to compare the instrument’s ideal response to its actual response. 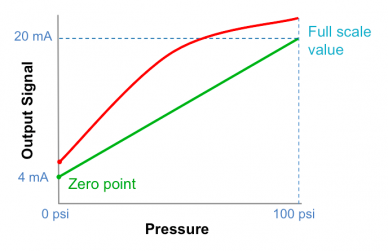 The ideal response of a pressure transmitter is graphed as a straight line from the zero point (at 0 psi) to the full scale value, or the upper range, of a pressure transmitter. This can be referred to as the ideal line (the green line in Fig. 1). In reality, no pressure transmitter exactly matches this line; the actual response is plotted as a slightly curved line, referred to as the characteristic curve. Figure 2: The accuracy of a pressure transmitter is calculated as the largest deviation between its ideal response (green line) and the actual response (red line). Accuracy, or the maximum measured error, is the largest deviation between the ideal line and the characteristic curve (see Fig. 2). Manufacturers of pressure transmitters will not define a device’s accuracy with only one variable. Accuracy takes into account several different variables, only one of which is non-linearity. In other words, non-linearity alone does not determine a device’s overall accuracy. Figure 3: Two methods are used to generate the reference line needed to find a pressure transmitter’s non-linearity: the terminal method, also called endpoint method (blue line) and the best fit straight line method (brown line). The linearity is the largest deviation from the reference line to the actual response (red line). The terminal method, also called the endpoint method, draws a straight line from the actual zero point to the actual full scale value endpoint. Since this method is based on the characteristic curve’s endpoints, it is a truer representation of a pressure transmitter’s non-linearity. The best fit straight line (BFSL) method is a straight line that stays within a certain percentage deviation from the characteristic curve, or actual response. The endpoints do not figure into this method. 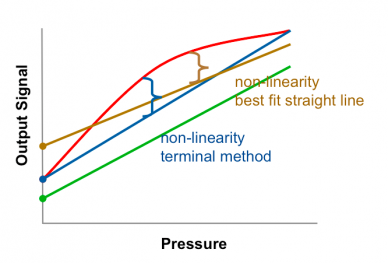 BFSL method values are typically half of terminal method values, meaning that a pressure transmitter with a ±0.25% BFSL non-linearity allows for a ±0.50% error. The zero offset is the deviation between the ideal line’s zero point and the characteristic curve’s zero point (see Fig. 4). Span tolerance is the deviation of the actual span from the ideal span between the zero point and the full scale point. The span offset is not related to the zero offset and has to be added to it. Hysteresis is the lag between a change in pressure and the corresponding change in the pressure transmitter signal. It is an indication of how fast or slow a pressure transmitter responds to input changes. Non-repeatability is the maximum difference in the signal of the pressure transmitter for the same applied pressure. It is an indication of how much the transmitter duplicates measurements for the same input. 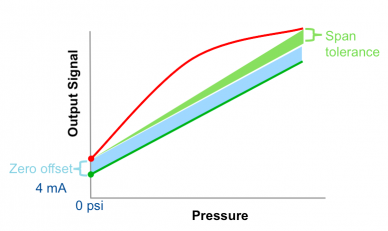 Be informed about accuracy vs. non-linearity when comparing pressure instruments. For example, WIKA’s A-10pressure transmitter with a 0.50% BFSL non-linearity may be a much better value, even if more expensive, than another manufacturer’s device with a 0.25% BFSL non-linearity. This is because non-linearity is only one of several factors used in determining a pressure transmitter’s accuracy. As mentioned above, other important variables to consider are the device’s zero offset, span tolerance, hysteresis, and non-repeatability. To help you sort through the terminology, contact us. We can further explain pressure transmitter accuracy and help you get the most value for your money. How to choose the optimum pressure range for pressure sensors and how does it affect accuracy and resolution?